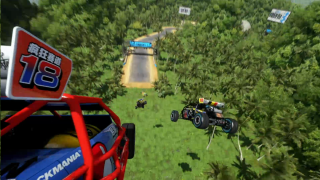 Everyone is super excited about The Division, but Ubisoft's real secret weapon this month is Trackmania: Turbo. At least, I'd like to think so, because the trailers released so far show the kind of fast, arcade-y and lighthearted racer that I've been craving of late. The trailer above is focused on the racer's multiplayer offerings, of which there appear to be plenty – at least locally. Among the usual split-screen and shared screen options there's also a mode where two people control the same car. That sounds pretty dumb, but it'll probably be a laugh. There's also the promise of 100 vehicle races online, which will appeal to anyone who likes to watch racing cars fall from the heavens. Trackmania: Turbo releases March 25.